I received this book for free from Wunderkind PR in exchange for an honest review. This does not affect my opinion of the book or the content of my review. A hidden laboratory…A brilliant invention…A team of quite unusual creatures…But can they save the department? Elliot Von Doppler and his friend Leslie think nothing ever happens in Bickleburgh, except inside the gleaming headquarters of DENKi-3000—the world’s fifth-largest electronics factory. Beneath the glass towers and glittering skywalks, there's a rambling old mansion from which all the company’s amazing inventions spring forth. And no one except Uncle Archie knows what’s behind the second-to-last door at the end of the hall. Until Elliot and Leslie are invited to take a glimpse inside. They find stooped, troll-like creatures with jutting jaws and broken teeth; tiny winged things that sparkle as they fly; and huge, hulking, hairy non-humans (with horns). It is unlike anything they’ve ever seen! But when Chuck Brickweather threatens to shut down the DENKi-3000 factory if a new product isn’t presented soon, the creatures know they are in danger. And when Uncle Archie vanishes, it’s up to Elliot, Leslie, and every one of the unusual, er, "employees" to create an invention so astonishing it will save The Creature Department. 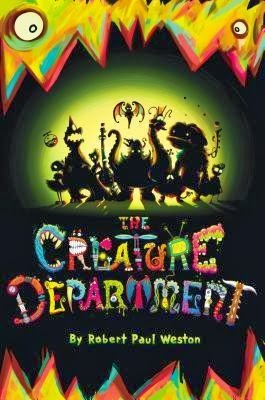 The Creature Department is a middle grade book that tells of the story of two 12-year olds, Elliot and Leslie. Elliot's Uncle Archie works for an amazing electronics company that makes things like wireless mints and other fantastical inventions. The company hasn't been making any new inventions lately, and the company is going to be sold. Uncle Archie asks Elliot and his schoolmate Leslie to come to the company and help him create a new invention. Elliot and Leslie discover that the world is a bit stranger than they ever thought possible when they meet Uncle Archie's co-workers, strange and wonderful creatures! Before I discuss the story, I need to talk about how pretty this book is! The title on the cover is raised and with each letter being shaped like a different creature, it looks super adorable. Also, the book jacket uses some glow-in-the-dark ink, so it glows (in the dark). This is the second book I have read recently that glows, and I love it. I think this gimmick is especially fun, because this is a book aimed at middle graders and the book is about creatures (I like the idea of kids reading this book in the dark with a flashlight). Once you open the book itself, you discover that the pages are just as beautiful as the cover. There are beautiful drawings every couple of pages, and there is a full page picture at the start of each chapter. The illustrations are gorgeous and the right level of cartoon-y for the story. I find myself looking back to the book just to flip through the pages and smile at the pictures. I should mention that although there are a lot of pictures, they are not overwhelming the text. This book should not be mistaken as a picture book. The pictures add to the story; they don't take over the story. Okay, let's discuss the story! This was a fun middle grade book. The world reminds me of something akin to a Series of Unfortunate Events or a Dr. Seuss book. Leslie and Elliot are normal kids, but everything around them is a bit odd. For example, Elliot's parents are food critics and want Elliot to go to Foodie School, so they want him to describe all of their failed trials at cooking. Uncle Archie and his team of creatures created wireless mints that download great minty taste into your mouth. As you can see, the Elliot and Leslie's world is contemporary to ours but a little bit "plus-ed." In regards to the plot, it was a cute story. Leslie and Elliot work together with the creatures and Uncle Archie to build a new invention that will keep the DENKi-3000 company in business. The story focuses on making friends even though they may look different from you and using your imagination. There were two weird side plots that had me scratching my head and feel a bit concerned about what message the book was making; however, everything was explained away by the end of the story and my worries were addressed and explained away. Overall, this was a fun middle grade book. I wouldn't recommend this book for an adult who likes to take a dip in the MG/YA pool, but if you know a younger reader, this might be the perfect book for him or her. I give this book a 3 out of 5. This does sound like a fun read, for my kids. However, I can't get my youngest son to read :( it makes me very sad - since I've found lots of good books for him. Oh well. Thanks for sharing, Pamela. Have a wonderful Wednesday. Glow-in-the-dark ink on covers. That is excellent! Alas, my nephews (the only young ones left) are both non-fiction buffs. Not complaining, they're readers, but not fiction readers for the moment. This looks adorable. I might just buy and read it for myself although I'm not that young anymore. Hahaha! This one has dropped considerably on my priority list - now it probably won't get read until my son gets to this age and we can read it together. I only read maybe one MG book each month or every other month. I know just the young reader to suggest this to! I love the cover! Thanks for the review! I'm not much of a middle grade reader but this one sounds unique enough that I might just have to pick it up sometime. That is so sad that you can't get your youngest son to read! I worry that my future kids won't like to read or the geeky stuff that my husband and I like to do. There is a middle grade book by Paolo Bagiclala... (I can't spell his name...he wrote The Windup Girl) called Zombie Baseball or something like that. I know it got a lot of good press when it came out. He wrote it specifically for kids who don't like to read. I know what you mean! I wish there were this many awesome MG and YA books when I was younger! I know what you mean. I don't read that many MG books anymore. When I was seeing child clients at the Psych Clinic, I would read a lot of younger books to keep up with the times. It is good to be the hip therapist who knows about transformers, High School Musical, and Twilight. Nowadays, it isn't as big of a deal. Thoughtful Thursday: What Attracts You to a Book?